San Francisco's answer to New York City's Fifth Avenue is Union Square, the United States' third-largest shopping area. Around Christmas, Union Square always get gussied up for the season. A huge Christmas tree goes up in the middle; an ice rink sprouts seemingly from nowhere, and all the shoppers take a stroll across the square to enjoy the scene. And all the store surrounding the square fill their windows with Christmas scenes. Macy's leads the way, with their entire store facade decked in lights. Also during the holidays, you'll find Winter Walk SF – a pop-up plaza that fills two blocks of Stockton Street with daily events. You can visit Union Square any time of year for great shopping. Find out more in this Union Square visitor guide. 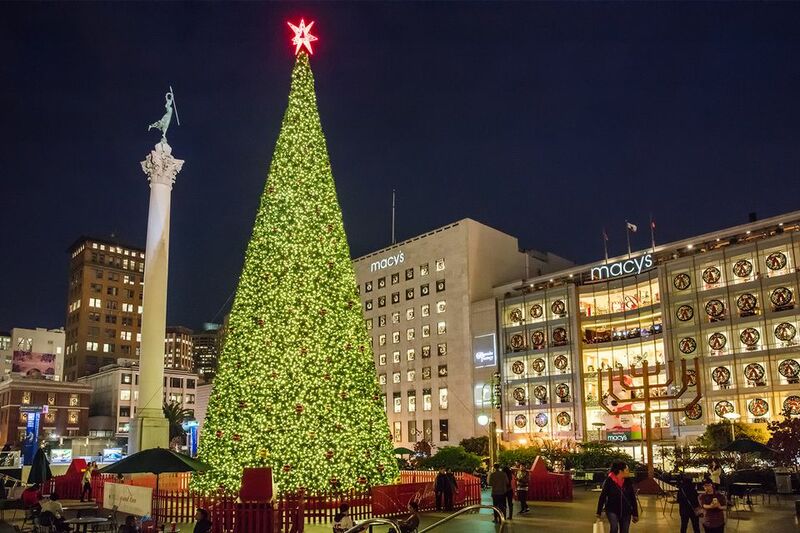 The big tree in the middle of Union Square is Macy's Gift to the City of San Francisco. It goes up every year and is usually lit for the first time on the Friday after Thanksgiving. Since 2011, the 83-foot-tall big tree is artificial - which lets just one more big evergreen stay put in the forest where it grew up. Early evening, about the time this picture was taken, is a good time to see the Union Square Christmas decorations at their most cheerful. The Union Square Ice Rink is open over the holidays, and into mid-January. Its hours include most of the day and last well into the evening, with 90-minute sessions starting every even hour. You can buy tickets on the spot - or avoid disappointment and get them online ahead of time. Get all the details about the ice rink at their website. One of the biggest department stores in town - and in fact in the entire western United States, Macy's has lots of storefronts to decorate. The big, five-story entrance windows take a colored glow, while the smaller windows in the section next door get filled with sparkling lights. The big entrance atrium at Nieman-Marcus is eye-popping anytime, with its gorgeous, gold-colored stained glass ceiling recycled from an earlier era department store called the City of Paris, built in 1896. At Christmas, they put a big tree up. If you stop and look at it for a few minutes, you might wonder how they get that big thing into the store, but rumor has it that it's a faux fir, built around a modular metal frame. From the Nieman-Marcus Rotunda Restaurant, you can have afternoon tea while checking out the top of that gorgeous tree - or watching the shoppers down in the square. Some of the Union Square department stores do nice holiday display windows, but don't expect the extravagances you might see on New York's Fifth Avenue. The windows at Saks Fifth Avenue are often the nicest ones around the square. Macy’s fills their Union Square Holiday Windows with adoptable animals from the San Francisco SPCA. This picture looks a little like it was taken with one of those wide-angle lenses people sometimes call fish eyes, but it's really more of a bird's-eye view. How can you get this perspective? Do you see the pole on the left? The object in the photo is a silvery sphere mounted on a light pole. Lean back against the pole and point the camera straight up to capture the reflected scene below. The Christmas tree is at about the two o'clock position, Macy's is at five. The ice rink is at ten. And the black blob at the bottom of the pole is the photographer. Street performers like this one are often found at Union Square, but at Christmas, they get into the spirit. Here's how you might get a cute pose like this from any San Francisco street performer: First, find some cash for a tip - it's the polite thing to do if you're going to take a street performer's picture. A dollar is usually enough. Find the spot you want to photograph from, where the performer won't have a tree growing out of their head or distracting objects behind them. When they see you with camera ready, they may hold out their tip can. Smile, nod, and gesture "in a minute." Hopefully, they will strike a good pose. Gesture "OK." After you take the photo and drop off your tip, be prepared to snap again if they return the "OK!" signal. According to the San Francisco Visitor's Bureau: "an elaborate gingerbread house war is waged every year between two of the area's most historic hotels: The Fairmont Hotel on Nob Hill and the Westin St. Francis on Union Square, just a few blocks to the south. These two vie every year to out-gingerbread each other in a friendly holiday spirit." This creation was in the lobby of the St. Francis. A purist might claim that the San Francisco Centre isn't really in Union Square because it doesn't face the square itself, but it's only a short walk away and certainly part of the holiday shopping scene. Every year, a light show transforms the center's 1908-era stained glass dome into a light show. The theme changes, but the one above is from the Nutcracker ballet performance. And while you're there, you can pose for a free holiday photo in Santa’s shop or with a holiday-themed backdrop. And if you haven't ever seen spiral escalators, it's worth a walk over there just for that.